These cards have been made using the Sarah Kay 3D mini books from Blue Edge Crafts. The pre cut card fronts are also from Blue Edge Crafts. Today I would like to share another miniature. This one is a room box and measures about 10"x 8". 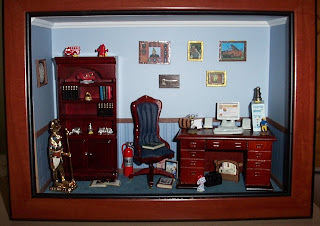 I made it as a gift for Ron and contains miniatures of things found in his study. I have made this card using a Studio Light 3D Image from Blue Edge Crafts I have used a 6"x6" cream card with a red overlay added a Spellbinders die cut from gold foil and the 3d image . Finished the card with Sticker Store stickers. Today I would like to show you another of my egg collection. 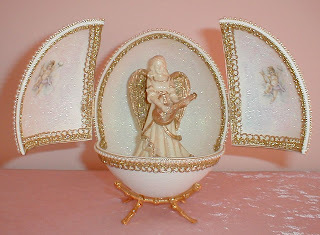 I call this one my Angel Egg and it has been cut from an ostrich egg. I found this Trinitage card at out local craft show recently and just had to try one. I found it very quick and easy to put together.There is also a 3d small version of the scene which I have used for the front of the card. Our card swap at Craft Mad this month was Butterflies I used the new Cheery Lynn Doily die from Blue Edge Crafts for one of my cards and added a Cuttlebug butterfly My second card was made using Papermania butterfly paper and die cuts. I used my favourite colours, black and white for my third card. Our latest Create and Chat was held at Craft Mad last Friday night.We all made a cute pop up card and I think that most of us unknowingly decided that bears were the theme of the night. This is the card I made. I have used a Cuttlebug embossing folder for the front and some digi images passed on by a friend for the inside so I am sorry I cannot give credit to the original designer. Our next Create and Chat night will be on Friday 1st July when we will be making a recipe book. The bathroom, study and lounge room I hope you have enjoyed this wander around my house. 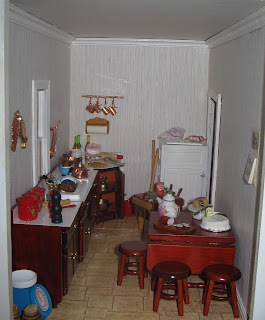 As promised last week, here is a few more of my miniature house. This is the second floor. 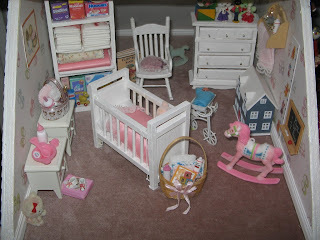 The nursery , games room and of course must have a craft room. 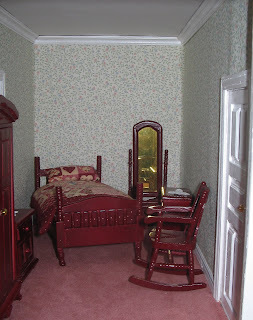 More rooms next week Thank you for visiting my blog this week I hope you have enjoyed it and will come back soon. This card is made using Alison Ellis paper . I love the little gold accents on these papers. The Pyramid 3D is from Blue Edge Crafts. 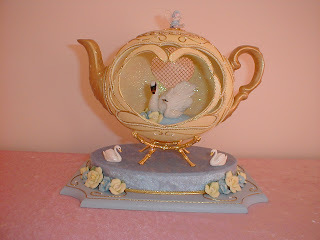 Today I would like to show you one of my favourite eggs shaped as a tea pot with Mum and Baby swan inside. 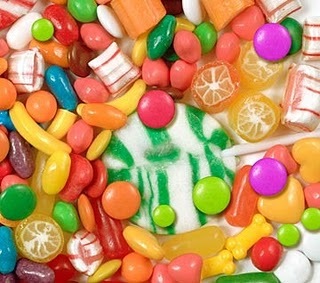 Everyone loves Blog Candy right? How would you like to win some? All you need to do is help us tell everyone about our new challenge blog "Unstampabelles Challenges". 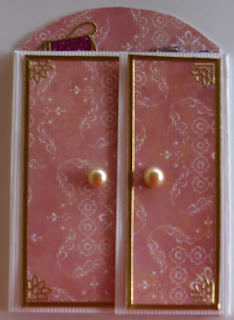 This challenge blog was created to share all types of papercrafting techniques without the use of stamps. 1. Add our Button to your Sidebar telling everyone about the Blog, or post about us on your blog. 2. Add your name and blog link to the link gadget. 3. A random winner will be drawn and posted on 4th July with our first challenge! The winner will receive a AUD $15.00 gift certificate the online crafting store they desire. We would love you to enter your paper creations e.g. cards, scrap pages, boxes, books, calendars, etc. 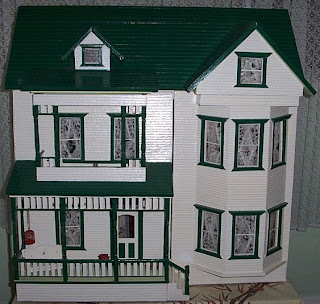 Using some of the following techniques: papertole, quilling, iris folding, stitching, beading, origami, fancy folds, cutting machines (e.g. craftrobo, cricut), paper punches, canvases, stickers, rub-ons etc Above all have fun!!! I call this card my "wardrobe card". I hung clothes made for stickers inside the wardrobe and added shelves for the handbags hats and undies . Blue Edge Crafts have released a new range of beautiful Combo papers named "Past Spodia". 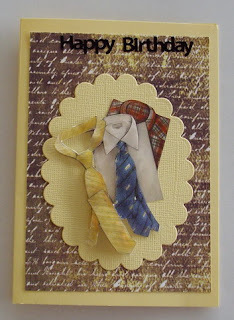 I have been been making cards with the new papers this week and I would like to show you some of them today. We had our Create and Chat night over at Craft Mad last Friday and this is the project. A handbag made from envelopes. These could be made using any size envelope. You are only limited by your imagination. A tutorial is available here Craft Mad. Thank you for visiting my blog this week. I hope you have enjoyed it and will come back again soon. Create and Chat will be happening over at Craft Mad tonight at 7pm QLD time. Why not drop over and join us . A few vehicle cards today, a mixture of 3d and stitched.